SPOTLIGHT: Lovely Pre-Code Loy (IV) | THAT'S ENTERTAINMENT! Welcome to another Film Friday! Today, we’re continuing our series of posts on the Pre-Code work of Myrna Loy, one of M-G-M’s sharpest and glamorous stars of the ’30s and ’40s. Though her greatest successes would come during the Post-Code era, the films of Loy’s early career demonstrate her versatility and the slow appropriation of what would become her niche — the sophisticated dame who could make audiences both laugh and cry. The films we’ll be covering over these next few weeks — and we will NOT be going chronologically — are all very different: in some we’ll see Loy as merely a supporting player; in others, she’ll be our leading lady. As one of the busiest actresses of the Pre-Code era, these posts will examine the way in which a second-tier actress grappled with defining her image into something that, though strangely Pre-Code, would soon take off and make her a major star in the immediate Post-Code years to follow. So far we’ve covered Penthouse (1933), Transatlantic (1931), and The Animal Kingdom (1932). Today, Love Me Tonight (1932). A Parisian tailor falls in love with a princess. Starring Maurice Chevalier, Jeanette MacDonald, Charlie Ruggles, Charles Butterworth, Myrna Loy, and C. Aubrey Smith. Screenplay by Samuel Hoffenstein, George Marion, Jr., and Waldemar Young. Based on a play by Leopold Marchand and Paul Armont. Directed by Rouben Mamoulian. 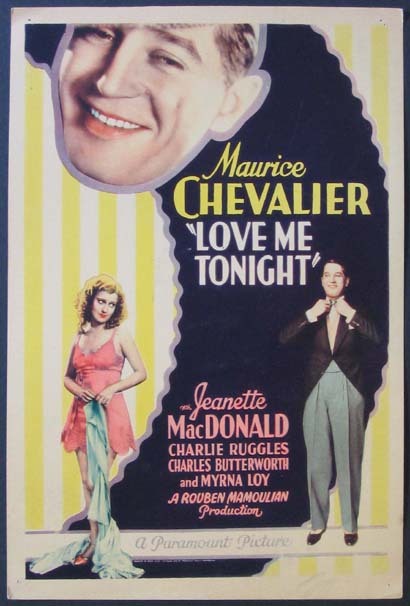 Classic film fans, musical theatre fans, pre-code cinema fans — Love Me Tonight is essential viewing. 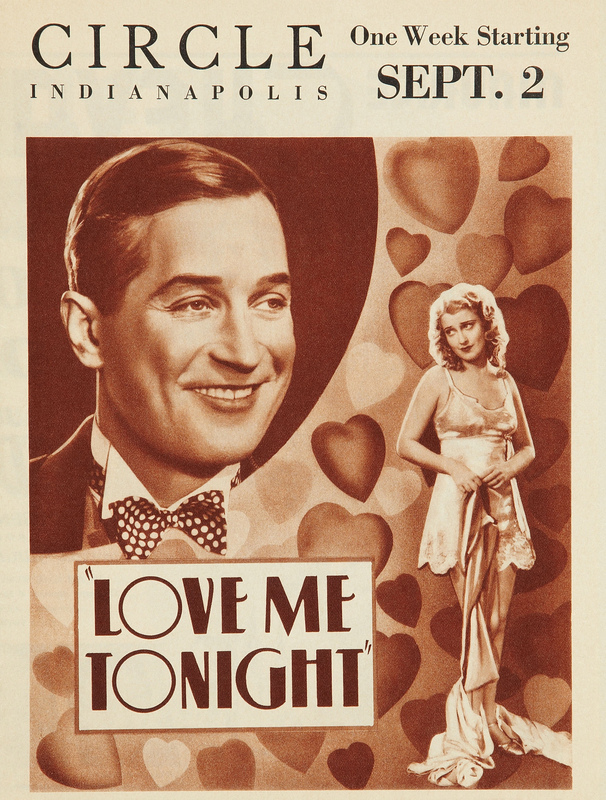 With a top notch cast headed by Chevalier and MacDonald, a melodious original score by Richard Rodgers and Lorenz Hart, and a story filled with both humor and romance, Love Me Tonight may just be the best musical film of the 1930s. Loy’s not the only member of the ensemble to give a highly memorable performance. Charlie Ruggles is excellent as the Vicomte who cheats Chevalier’s character out of his money, while Charles Butterworth gives depth to his role as MacDonald’s ineffectual suitor, and C. Aubrey Smith is expectedly amusing as the head of the house. And I Love Lucy (1951-1957, CBS) fans may delight in seeing Elizabeth Patterson, better known as upstairs neighbor Mrs. Trumbull, as one of the three kooky aunts, who function similarly to the witches in Shakespeare’s Scottish play. But, this film is a showcase for our leads. MacDonald does an admirable job of making her character, who at first appears quite nasty (because she’s painfully chaste), likable, while Chevalier, whether he’s your cup of tea or not, is completely charming and believable in his role as the idealistic tailor who falls for the hardened princess. 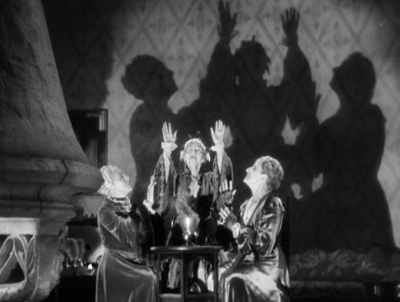 Meanwhile, Mamoulian’s direction is outstanding. As we saw with 1929’s Applause, he’s a master at making the camera feel alive, moving it around in ways that most directors wouldn’t. The cinematography, the design, the scope — everything visual about this film — is superb. It’s romantic, it’s heightened, and yet there’s a simplicity. The best remembered sequence from the entire film is “Isn’t It Romantic?” a stirring number which moves from the boisterous Chevalier in his Parisian shop throughout the countryside to the Princess on her shadowy balcony. With truly inventive shots and marvelously fluid editing, the scene is brilliantly cinematic — conveying an idea that would be impossible in any other medium. Mamoulian is supreme, and this is one of his crowning achievements. Speaking of crowning achievements, Love Me Tonight is blessed with Rodgers and Hart’s best non-stage score. In addition to the iconic number above, another one that caught on is “Mimi,” which likewise moves from location to location in a montage that really bounces. Take a look. I’ve also always been partial to “Lover,” which is sung here in a surprising context — MacDonald to the horse she’s riding. Watch. There are a handful of other great songs, but I’ll leave you to discover those for yourself. Though Loy’s not the main draw here, she’s one in an ensemble of wonderful players — singing wonderful songs. Needless to say, this film comes highly recommended. Come back next Friday for another Myrna Loy film! And tune in on Monday for the start of a whole new week on That’s Entertainment! 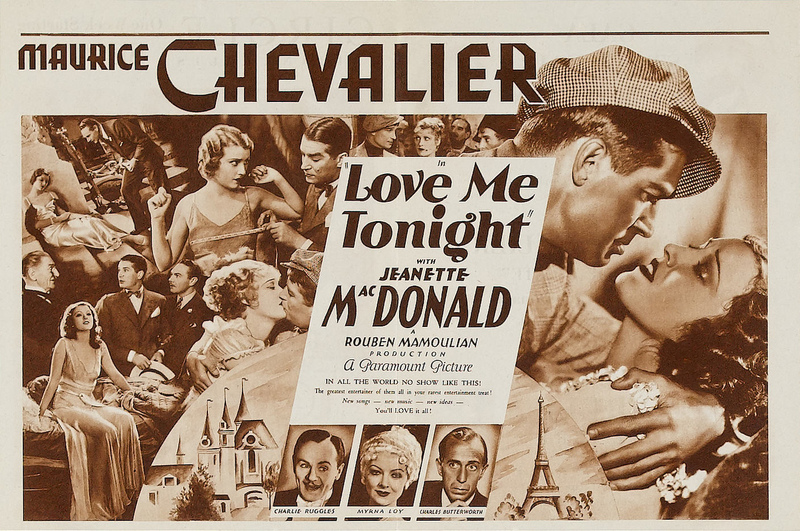 I always liked Jeanette MacDonald paired with Maurice Chevalier better than with Nelson Eddy. Although my all-time favorite MacDonald vehicle has to be San Francisco, with Gable and Tracy. You can have your modern computer-generated effects, the effects in this picture still impress me after nearly 80 years. Hi, Leslie! Thanks for reading and commenting. I too enjoy SAN FRANCISCO (1936), although I must admit that my favorite rendition of the title number is by Judy Garland on the CD release of her live 1960 concert in Paris. I just got (for a very low price) a DVD containing 4 episodes of The Judy Garland Show which coincidentally features her singing of San Francisco in one segment. 2 of the “standatd format” episodes and 2 concert shows. If you branch into more variety shows at some point, I hope you will cover this remarkable record of an unforgettable talent in her later years. Thanks. A fascinating and well out together post. Regards from Thom at the immortal jukebox. I’ll be returning to this blog. Hi, Thom! Thanks for reading, commenting, and subscribing! I have been looking for some info on this movie. I found a window card for this movie that I can’t find another like it. It shows Maurice wearing his famous hat and has bright colors. I found another movie poster with Maurice for the movie the Lieutenant. It is the same pose. Hi, Shelly! Thanks for reading and commenting. If you haven’t seen this film, I recommend it wholeheartedly. Also, be sure to check out my thoughts on THE SMILING LIEUTENANT here, and stay tuned for another Chevalier Pre-Code musical coming up on Wildcard Wednesdays before the year is out!